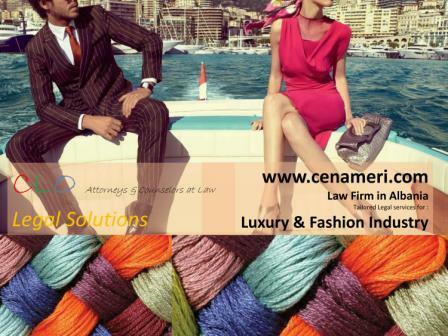 The firm comprises lawyers, tax lawyers and other professionals well-versed to address all of the issues faced by Luxury, Fashion, Sport and Celebrity industry. The luxury goods and fashion industry has rapidly expanded in recent years itn Albania, driven by rising worldwide consumption, growing middle classes in emerging markets, and major strides in online retail sales and marketing. These developments have also brought new challenges for the industry as companies face more stringent regulations as well as complex tax and corporate issues as they expand into new markets. As luxury good and fashion companies gather large amounts of customer information, data protection and privacy have also become major concerns. With a wealth of experience acros all relevant areas of law, our Luxury & Fashion lawyers help overcome thene challenges, working to advice clients on local legal and commercial developments in the region. Our services include seeking swift seizure and injunction proceedings to protect client brands, establishing trade and commercial compliance programs, developing IT solutions for digital sales and marketing, advising on employment issues, creating innovative transfer pricing strategies, and managing real estate portfolios. Driven by client demand and on obvious gap in the Albanian market, we also develop insights and guidances for retailers on the major regulations, commercial issues and trends impactig the industry.